Mention Rutland Boughton and everyone thinks of The Immortal Hour, the longest run of performances for any opera ever, and so on, but actually there are twelve other music dramas too. There are six concertos, two string quartets, sonatas for violin and cello, three ballets, masses of songs and, lastly but not least, two extant symphonies. 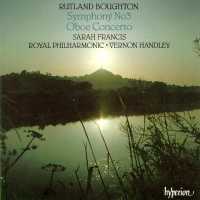 It is the second of these (his third symphony in fact, but the first is lost) that appears on this fascinating disc. It is remarkable music: strong themes, strongly worked out in compelling symphonic argument. According to Boughton's biographer, Michael Hurd, the composer heard it once, given by an orchestra specially assembled to mark his 60th birthday. The audience included Vaughan Williams, Roger Quilter and Alan Bush. After that, nothing until the BBC Philharmonic under Edward Downes broadcast it in 1983. Why Downes should have done so is self evident in the music (and in his own vivid recording of that event, available on Carlton Classics and coupled with the Second Symphony. 15656 91892.) Why a lot of others (the present company of Vernon Handley excepted, of course) have not followed him is a mystery at best, a shame at worst. you may need to download RealNetworks' realplayer G2.